Parks are meant for play and leisure, a pleasure denied to the children of Mangol Puri. With their community parks used to stow vehicles, throw garbage and other anti-social activities such as drinking and gambling, Mangol Puri’s children were forced to play on the streets, its senior citizens left without a place to relax in. The issue came up at one of Dr. AV Baliga Trust’s youth group meetings, where members of the organization’s Eco Club meet periodically on social and environmental issues. Most of them had seen their neighbourhood deteriorate and wondered if the situation would ever change. With a need for change on their minds, they joined the e-learning centre run by Dr. AV Baliga Trust a year ago. Over and above their computer education, they became a part of tdh’s youth network. This network helped them develop an understanding of local issues in the context of larger ones at state and national level. They shared their concerns and problems with youth from different parts of India and learnt ways to address them within their local context. Mangol Puri’s open spaces and parks were not being put to the right use, adding to the area’s other problems. The dumping of garbage was breeding flies and mosquitoes. Plants and trees had been cut. The group decided to take up this issue, dividing themselves into sub-groups for different tasks. Four of them went to the forest department and fetched 100 saplings, another 15 wrote slogans on Safe Environment while the rest drew pictures about the problem. 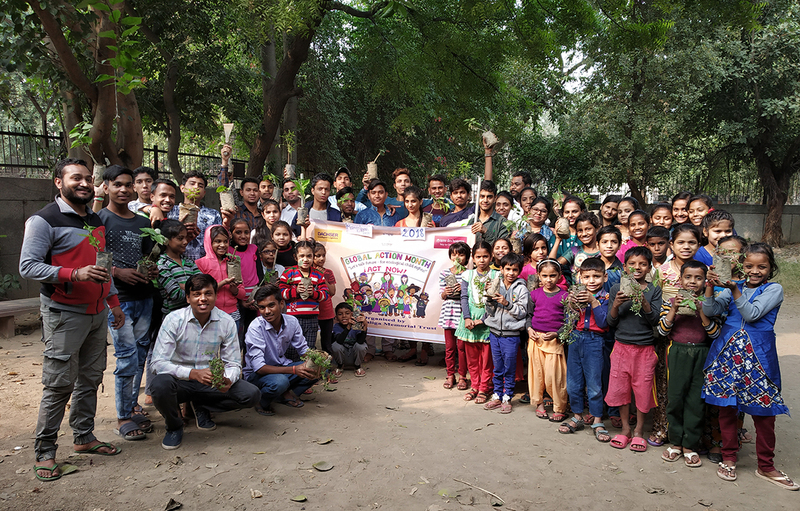 Mobilizing friends, parents and others from the neighborhood on World Environment Day to create awareness and action, they also met the local councilor and asked for his support in cleaning the parks in three different blocks of Mangol Puri. With community participation they planted the saplings, also taking on the responsibility of monitoring their growth. A key challenge for the group was how to keep the momentum going. The answer they found was to reframe their work into a project titled Green Parks. They prepared goals, objectives, an action plan stating roles and responsibilities for all the youth group members. Soon they had an annual plan for awareness walks, tree planting in other parks in the area, keeping watch against garbage and advocacy with the Municipal Corporation of Delhi to put gates on all the parks. Within three months the Municipal Corporation had put up gates as well as swings for children. Free of the risk of becoming garbage dumps and parking lots, Mangol Puri’s parks have returned to being happy places where children play and seniors spend their leisure time. The walls of the park, painted by the youth group, announce their mission, “The city should be safe for all, especially women”. They are also a testimony to the determination and success of a small group of youth who would accept the decay of their neighbourhood.